World Expos. Always in the spotlight as long as they last for. Millions of visitors, thousands of exhibitors. A real architecture fair. What happens though, when the lights go out and people leave? Since 2007 the American photographer Jade Doskow is documenting the architecture and landscape of the past World Expos. Monuments in a dystopian environment standing there and time passes by. On the other side, landmarks that are worshiped everyday by people, whose vast majority don't know their initial reason of existence. I am delighted to have spoken with Jade and she answered my questions about the project and her future plans. When I read the title of your project in Dezeen and saw the front picture, I couldn't wait to read and see more. I read that everything started during a family trip in Seville. What triggered that idea for this project? Where you looking for inspiration or did the idea appear in front of you? As an artist it is important to be in that certain ‘zone’ for inspiration to strike, a feeling of being relaxed and open to what may come. On both a subconscious and hyperaware level I was always very in tune to the history of things, the swirling of past-present-future around me at all times, from when I was young, living in a 300+ year old house, to when I first moved to New York and could bear witness to the rapid and constant transformation of the cityscape around me. And as traveling often causes a new receptivity to form and concept, it was a ripe moment for the realization that this could be a fascinating project to research upon seeing, for the first time, a dilapidated, vast World’s Fair site. The starkness of the contrast between the 1992 site and the city of Seville struck me immediately, as the city is old, grand, breathes its history and presence with every bit of stone, as compared to these somewhat garish postmodern 1992 Expo buildings, white but a bit weathered, weeds growing throughout the walkways and canals and courtyards, and not emblematic of especially exciting contemporary design. There was a resignation and confusion to the site and its state of half-use which was exciting to me. I understand that such an idea for a project can be really motivating. I took you twelve years to finish the first part of your project, during this time I believe you did a lot of research about the sites/pavilions and how to access them (or not). Was it easy travelling across America and Europe, spot and access these sites? I have spent much more time researching, planning, and doing post-production work with this project than actually out on shoots, which is often the case with such work. For all of the sites I would first spend studio time studying original fair maps, and lining them up with Google maps of the site as it exists today (or whenever the Google cameras documented them), assessing the boundaries, the structures and sculptures that still exist, and access points. In the first few years I would just show up to the site and shoot, with varying degrees of success. While often these are large public parks today, there are often city events for which sections of the parks are closed off. On my first shoot in Montréal in 2012, an entire island was closed to the public—-and photographers—-for a semi-private Nascar event. I have also had mixed results for specific structures, such as Habitat ’67, also in Montréal, which is a private housing residence and so not particularly open to photography. Over time Lost Utopias attracted positive press, exhibitions, a presence, and I then had the reputation to approach site directors, coordinators, and controllers ahead of time, and they were often quite thrilled for their city and architecture to be part of the project. I have worked with wonderful people in many of these cities who gave me off-hours site access and assisted me in making the work—-probably the most magical of these experiences was photographing at 6 a.m. in the St.Louis Zoo, hours before public admission, setting up among the wild calls of large birds and animals, a mist hovering just between me and them as I made the pictures. I also had to spend a lot of time fundraising to make this work, and this was quite time-consuming as well. In fact, I am about to dive back into grantwriting mode to fundraise to photograph all of the Asian sites over the next year or two. As an architect, traveler and amateur photographer, every time I visit a place, I do a research about the places I want to visit. I am very well aware of that feeling, when you approach a place or building that you know and have been reading a lot about. How did you feel during your expeditions to the old Expo sites? Some of these places were once full of life and now standing there abandoned. On the contrary how did you feel visiting the ones that still remain popular and have become landmarks? I enjoy mystery and intrigue, so certainly the sites that were less touristy were more exciting and atmospheric to spend time in and to investigate visually—-for the most part. Early in the project I read Erik Larsen’s excellent Devil in the White City which sparked a fascination specifically with the 1893 Chicago site. As perhaps the most well-known American world’s fair, at least of the 19th century, the contrast between what existed, magnificent, sparkling, vast, and grandiose, as compared to what is left—-a large, wild public park and one building—-certainly sparked my imagination when working. The Eiffel Tower and related icons provide a different challenge, which is how to photograph in a more complex, nuanced manner than the typical ‘postcard’ view. How can I describe the past-present-future in one picture? How can I talk about city design and preservation in one picture? The Eiffel Tower picture was one of the first such icons that I photographed in the project, and the obvious thing it felt to do, once there, was to frame the 1889 tower within the Trocadero and Palais de Chaillot—-which were constructed later for the 1937 exposition—-and also within the context of the tour buses lining up, thereby in one picture describing the structure itself, the vision which Paris approached the site by reusing and adding to for future expositions, and the current reputation as arguably the most popular tourist attraction in the world. Some of the architecture still exists as exciting and breathtaking as it was when constructed and were thrilling to photograph even as tourist destinations. Specifically, I am thinking about the photograph Seattle Science Center - Arches at Night. These gleaming, bone-white arches rose high above the site, in stark contrast to the black night sky, ethereal, airy, extremely 1960’s and simultaneously futuristic in design. Could you please tell me a bit more about the camera you are using and what made a good composition for you? Are you going to continue capturing these beautiful photos with the same equipment and composition principles or are you going to have a different approach for the next part of Lost Utopias, using what you have learnt all these years? All of the Lost Utopias photographs were captured with a large format 4x5 film camera. The first year I was working with a more compact wooden Wista field camera, and then I moved on to a proper architectural Arca Swiss, so about 40 pounds of equipment. This approach is not dissimilar to what the early photographic pioneers would have used for the early world’s fairs. It does take a long time to set up, and unlike a digital camera, in which you can quickly capture the moment, with a large cumbersome camera there is a delicious frustration as often the moment or light passes and I must wait and wait and wait for another such moment of clarity and perfection in light, time, and movement. Using this equipment forces a more thoughtful and aware approach, and is also a much more formal way of picture-making. As the types of film are becoming less readily available, I am researching digital large-format options as a possibility for future work. 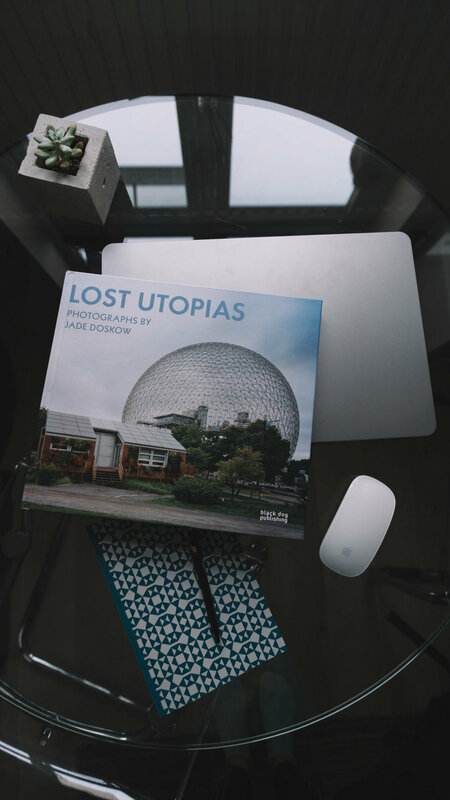 After finishing the North America sites in 2016, her project Lost Utopias has been published by Black Dog London. She now wants to focus on the Expo sites outside Europe and America, and want to visit other areas in the world like Japan, China, South Korea and Australia.